A 16-year-old Karen boy swims in the Salween River at the Myanmar-Thai border. This piece has been reblogged from The Conversation, who actively encourage reblogging and the open flow of information. Click here to see the original piece. Thousands of protesters gathered in Myanmar’s North Kachin state on October 4, as fresh violence and clashes between ethnic groups continue to mar the ongoing peace process. But hopes for economic development in the region remain high, particularly related to potential foreign investment in the country’s growing hydropower infrastructure, as State Counsellor Aung San Suu Kyi signalled to US investors at an international conference in Washington in September. One planned project would directly impact the Salween River, which supports a biodiversity comparable to the Mekong. The Salween is Asia’s last free-flowing international river, home to 7,000 species of plants, 80 rare or endangered animals and fish in China, as well as about 7 million people who depend on its ecosystem for their livelihoods. Currently, a total of 15 hydropower dams are planned on the mainstream of the Salween, eight within Myanmar. Human rights advocates have expressed concerns about the Salween development projects, which would affect populations in three countries. 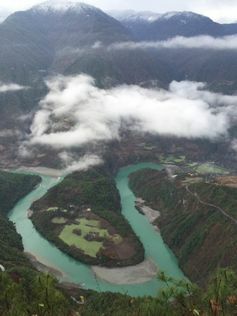 Known as Nu in China, Salawin in Thailand and Thanlwin in Myanmar, the river originates on the Tibetan plateau, flows through China’s Yunnan Province, and passes through Myanmar, in places forming the border with Thailand, before emptying into the Andaman Sea. Geography may have shaped the river’s historic trajectory, but today it is globalisation, as manifested in national strategies to promote economic growth and regional integration, that is shaping the Salween basin’s development. Map of the proposed dams in the Salween basin. While large-scale infrastructure development is presented as a means for economic development and reducing poverty in developing countries, such projects pose considerable risks for local communities living along the river - and for the environment at large. If built, the Salween dams will not only alter the river’s ecosystems and their monsoonal water-level fluctuations, but also transform a wide range of agricultural landscapes that local communities depend on for their livelihoods. In recent years, amid concerns over hydro-electric projects, international financial entities, such as the International Finance Corporation (IFC), have started to focus on promoting the idea of sustainable hydropower. In Myanmar, this means a “basin-wide perspective” to effectively govern the hydropower planning in the country. Similarly, the Mekong River Commission, Asian Development Bank, and World Wildlife Fund have joined efforts to develop a Rapid Basin-Wide Hydropower Sustainability Assessment Tool as a way of reducing environmental impacts from hydropower. Wuli village in Yunnan, South China. While in principle these efforts are commendable, it remains to be seen whether they will lead to meaningful environmental or human rights safeguards in the context of the Salween River. Indeed, sustainable and just development cannot be achieved if the views and needs of the poor and marginalised are not taken into account in natural resources management. In the Karen state of Myanmar, for example, large-scale infrastructure projects have historically been linked to conflict. Recently, thousands of local villagers were forced to flee their homes due to the violent armed conflict occurring in the vicinity of the planned Hatgyi dam on the Salween. With the long history of violent conflicts involving the Myanmar military and ethnic armed groups in various states, hydropower development on the Salween River is, in fact, closely linked to the wider discussion of Myanmar’s ongoing peace process. The outcome of these infrastructure projects could have direct implications for the significance of the peace process. In its attempt to promote sustainable hydropower, the IFC is seeking to establish the sector’s first Hydropower Developers’ Working Group as a platform for hydropower companies to improve sustainability and business operations, and has arranged a series of dialogues between government agencies, civil society groups and NGOs about hydropower planning in the country. Save the Salween, reads the placard. Local communities have gathered to pray for the river in an international organised event. While these efforts could in theory open up room for debate, it is unclear whether they will act as a catalyst for change to empower local communities towards more informed, inclusive, and accountable water governance. Historically, hydropower decision making tends to occurs without local community involvement. Power asymmetries complicate the consultative process. Providing clear answers to communities living along the river on whether the generated electricity will be used for domestic consumption (for example, bringing electricity to rural areas) or mainly for export to neighbouring countries would be a first step toward a more effective, transparent discussion. A promising advance in Myanmar was the establishment of Salween Peace Parks, which combine biodiversity protection, forest management and sustainable livelihoods. The mechanism is based on existing land-tenure management in Mudraw (Papun) District in Karen State, and has brought to light the crucial role that local communities, environmental NGOs, and the de facto ethnic government play in natural resource governance. A man and his goat cross over the Nu River on a cable, near Lushui southwest China’s Yunnan province. Last but not least, hydropower development planning on the river in Myanmar cannot be analysed in isolation from what is happening in China. There, environmental NGOs have played an important role in achieving more comprehensive environmental assessments of proposed hydropower projects. In 2004, for example, critics were able to halt a plan for hydro-electric dams at the Nu River that, according to the initial asessments, would have forced the relocation of 50,000 people. When the plan was revived in 2013 after citizen input, the number of hydropower projects was reduced from 13 to five. Recently, economics has also been factored into a reassessment of hydroelectric development: China’s economic slowdown has resulted in an oversupply of electricity generated from hydropower plants, making hydropower development not as attractive as it was before. Whether you call it the Nu, the Thanlwin, or the Salween, this long, international river brings to light the complexity of hydropower projects in the developing world. It highlights once again that dam development should only take place if it serves a greater purpose for the local population (food security, for instance, or flood prevention), including potentially affected communities, beyond its current positioning as way to promote economic growth. In June, WLE-Mekong published a series of maps identifying a massive range of dams across the major rivers of the Greater Mekong Subregion. In this interview excerpt, the first in a series of two, WLE-Mekong's Kim Geheb points out hot spots and opportunities arising from these maps. Managing transboundary river basins is a huge challenge. Even if there are no overt tensions between countries, local communities and national governments tend to act out of self-interest. How can we connect a growing urban class to the farmers who produce our food? A new online platform in Lao PDR aims to bridge this divide and restore the country’s rich natural heritage. Scalar disconnect: the logic of transboundary water governance in the Mekong. Suhardiman, Diana; Giordano, Mark; Molle, Francois. 2012. Scalar disconnect: the logic of transboundary water governance in the Mekong. Society and Natural Resources, 25(6):572-586.